The e-Courts scheme aims ICT enablement of the lower courts across the country in their functioning. The project envisages deployment of hardware, software and networking to assist district and taluka courts in streamlining their day to day functioning. Key functions such as case filing, allocation, registration, case workflow, orders and judgments will be IT-enabled. Causelists, Case status, orders, judgments will be available on the web and made accessible to litigants, advocates, and general public. The project aims to build a national grid of key judicial information available 24x7 in a reliable and secure manner. National Informatics Centre is the implementing agency for the project. NIC personnel at District level will be part of District Project Monitoring Committee, headed by District Judge, to look after progress of e-Courts Project in the entire District, including Taluka Courts. NIC technical personnel will advise the District Judiciary in site preparation activities, HW installation, Networking, Application SW implementation and all other technical issues. The project is being implemented under the guidance of the e-Committee. The office of e-Committee provides the valuable interface to the judiciary, and also supplements NIC in all implementation aspects. Hon"ble e-Committee Chairman, Sh. Justice P.K.Balasubramanyan, has been personally visiting all High Courts and continuously engaging all High Courts for successful implementation of the project.Department of Justice is providing key support for project monitoring and evaluation. All High Courts have appointed Central Project Coordinators for managing the implementation of the project. Release of orders to the copying section: As soon as the judgment is signed. To manage the nation wide project, NIC has developed a comprehensive Project Progress Monitoring System to capture key project data such as number of Court Complexes, Judges, High Court Committees, Project Personnel, Existing Hardware, Network etc. The PPMS also captures project progress details for Site Preparation, Distribution and Installation of Hardware and LAN, Training, Internet Connectivity, Laptop and Printer Status, etc. The PPMS provides access to key project documents; generate customized status reports for all stakeholders, general information on - Vendors, Product Installation, and Software Updates. The District Courts have shown active participation in updating data on the website. The website today has 2280 court complex registrations including 756 district court complexes and 5545 Judges" registration. Other key data such as availability of Videoconferencing facility, DG Sets, hardware at district and taluka courts is being collected through the website. All District Courts are requested to provide information required by NIC through the website and ensure that data provided is complete, accurate and validated before being sent. District Courts that have uploaded data on the website are requested to update it on a regular basis. Going ahead in the future, the website would become the single most important source of project progress and reporting. NIC intends to use the website as the only source of data for implementation of the project. Training on the basics of computers has been imparted to 11005 / 13365 Judges and 44020 / 60000 Court Staff. Broadband / Dialup Connections provided at 9733 / 13365 Judges residence, 489 / 525 District Court Complexes and 740 / 1530 Taluka Court Complexes. Job Orders issued by NIC, for deployment of 600 System Officers at district court level, for a duration of 18 months. Empanelment process for hardware vendor completed. There will be only one counter at JSC where no. of courts in a complex are up to five. There will be two counters at JSC where no. of courts in a complex are more than 5 but less than ten. There will be three counters at JSC where no. of courts in a complex are more than ten. District and Subordinate Court Software is being tested at 6 Pilot Sites viz. Mumbai & Chennai, Nainital (Uttaranchal), Gwalior (MP), Cochin (Kerala) and Kamrup & Nogaon (N-E). Additionally, feedback has been requested from users at Bhubaneshwar, Shillong, Raipur, Silvassa, Ahmedabad and Kolkata. Work has been initiated for enabling selected software to provide support for major regional languages including Hindi. To manage and coordinate maintenance of ICT infrastructure such as computers, scanners, printers, LAN, Internet connectivity, communication equipment such as switches, routers, modem, Wi-Fi etc at the respective court complexes put under their charge. Interaction with vendors for maintaining and supporting the equipments as and when required by the court administration. Coordinate with concerned vendor, installation and maintenance of OS, office tools and the like. To maintain customized application with reference to reinstallation and upgradation with new modules/patches. They will be selected by a committee to be constituted by the high courts. The Selection Committee at HCs is to consist of High Court nominee, a technical expert from the State and Nominee of NIC. The vendor has to submit resumes of candidates in ratio 1:3, i.e. for one position, 3 resumes. Some of the key issues faced by the e-Courts project are as follows. Inadequate funds for Site Preparation: Cost estimates for site preparation in the original proposal were insufficient, due to increase in number of court complexes. Hence, additional funds are required for site preparation. Due to this reason it has been decided that priority should be given for site preparation of district court complexes. Once additional funds are made available all court complexes in the country will be covered. Power Backup: Due to budgetary constraints, funds for providing connectivity from DG Sets to ICT Infrastructure may not be provided under the e-Courts project. All such cabling and installation costs have to be borne by the High Courts. Recurring cost for maintenance of DG sets shall be borne by respective HCs. Project Monitoring Website: There have been delays by HCs in uploading the required details on the PPMS website. Since NIC is dependent on the website for key project data, all High Courts must ensure that data uploaded is complete and accurate. Videoconferencing Facility: The project envisages VC facility at 500 locations. Providing facility only at district courts without covering jails will not be beneficial. Since allocated funds are insufficient to provide VC facility at all jails, further funds are required. The three modes will function in a unified IP address space. The primary internet connection at the court complex will be provided by either SWAN or NICNET (via 2MBps leased line) depending on the availability in the respective state. A dedicated BSNL broadband connection will also be provided at each court complex as a back-up connection in order to provide a reliable and redundant network. 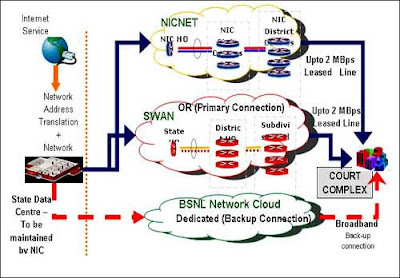 In places where NICNET and SWAN are not available, the BSNL broadband connection will act as the primary connection. The bandwidth of the broadband connection will vary according to the workload estimated for respective court complexes. Number of nodes in a court complex shall determine the number and configuration of switches (level 2 or 3) and routers.